Don't let this happen! Check out Covert Threads socks. Give the gift of a sponsored care package this holiday season! If this is the first edition of the MarineParents.com Newsletter you have received, WELCOME! If you are a returning reader we are glad you have joined us. We thank you for your support and hope that we can support you. This edition of the newsletter is an overview of the MarineParents.com web site and the many services offered to the families and friends of Marines as well as services for Marines. Bringing Marine Corps families together to Connect & Share™ with one another is our primary function. Our mission includes four distinct areas: Informing, Connecting, Sharing, and Supporting. We DO NOT address or allow political issues. We DO allow freedom of spiritual proclamations, support and prayer. We DO believe in God, Family, Country and The United States Marine Corps. Community awareness for troop support is a vital component of our work at MarineParents.com. The Care Package Project™, Operation PAL™, and Team Marine Parents™ provide opportunities to involve your community in actively supporting our troops. On behalf of the volunteers of MarineParents.com, I would like to wish each of you a Merry Christmas and Happy Holidays. The web site addresses a wide range of topics, each backed by links to official sites and resources. Topics include the United States Marine Corps, MCRD bootcamp and graduations at both Parris Island and San Diego, unit and battalion information, combat, deployments, military benefits, resources for our new generation of combat veterans, and countless other topics including relaxation and coping skills. Support for family and friends of our U.S. Marines is offered through the web site�s trademark in "a Place to Connect & Share™" which includes live support, email support, chat rooms and message board communities. Both the chat rooms and message boards are moderated for safety and to assure compliance with OPSEC (Operational Security). Overwhelmed with the prospect of sending your recruit off to bootcamp? We offer "a Place to Connect & Share%trade;" putting friends and family members from each graduating platoon together on message boards and chat rooms for support and encouragement. The bootcamp section of the web site includes the training matrix, what to expect from the USMC, graduation information and much more. Deployment presents many challenges for families of our Marines. We offer "a Place to Connect & Share™" putting friends and families from each unit together on the same message boards and chat rooms. Use the deployment information section to find answers to every question you may have including phone cards, care packages, travel, communication, contact information and more. Involve Your Community in Supporting Our Troops! We ship 700-1000 care packages every 10 weeks to Marines stationed in combat zones. Family and friends can request a package to be sent to their deployed Marine at no charge. Organizations, individuals, and communities are encouraged to support our troops by working with us to donate both funding and care package items. As per military policy, addresses are not given to the public. You can encourage community awareness for Supporting Our Troops by holding care package drives and sending the items to MarineParents.com to ship to our Marines overseas in combat zones, or asking your community to sponsor a care package. Our program assures Marines' overseas mailing addresses and last names are never published. Operation Prayers and Letters™ is a project that supports our Marines who have been injured. We work with families to setup a private mailing address for the injured Marine. People, church groups, and school children around the US add these Marines to prayer lists as well as write cards and letters for the Marines which we forward in huge envelopes for the Marines. The morale boost is incredible! Beginning January, 2007 we'll provide lunch one weekend each month to the Marine Corps families in temporary residence at Bethesda Naval Hospital. Every Marine is assigned to a unit or battalion in the Marine Corps. Often, finding information about that particular unit can be challenging. Our database includes virtually every unit in the Marine Corps and includes base locations, current station, phone numbers, the unit FRO (Family Readiness Officer, a contact for family members), and links to the unit�s message boards and chat night schedule. The Marine Corps News Room is a collection of news articles about our Marines, the United States Marine Corps, and our Marine Corps families. The news room is updated daily with articles from around the globe. You can simply visit the web site to read the articles, or it is also available as an RSS data feed which you can subscribe to through most internet communities like Google, MSN and Yahoo! The MarineParents.com, Inc. Conference is held in a different state every year on the third Friday of April for the full weekend. Join other Marine Corps family members for a weekend of fun, education, and esprit de Corps. The conference includes VIP Marines, key note speakers, banquets, workshops, presenters, vendors and exhibits, authors� hall, and "a Place to Connect & Share™" with one another. In keeping with this year's conference theme, �Honoring Our Marines Today and Tomorrow�, our keynote speaker will be LtGen. George R. Christmas who is currently the President of the Marine Corps Heritage Foundation. Additional speakers will be Colonel Jack Jackson, USMC Retired, and Dr. Mike Colson, former Navy Commander and Chaplain who is now the outreach coordinator with the Seattle Vet Center assisting returning Iraq and Afghanistan veterans. We'll be including several active duty Marines as speakers, authors, and presenters as well. We offer private services to "Gold Star Families", those that have lost their son or daughter during active duty with the Marine Corps. Meeting and communicating with families who understand your pain and grief can help. We give you that opportunity, no matter where you are in the world, in a private chat room, message board, and annual gathering. Access to this area is limited to Gold Star family and friends only. Team Marine Parents™ is comprised of Marine family members and Marines who participate in either the Bootcamp Challenge at the Marine Corps Recruit Depot in San Diego or the Marine Corps Marathon in Washington, DC each October. The mission of the team is to raise community awareness to support our troops and to raise money for the projects and services offered through MarineParents.com, Inc. We are always looking for more folks to join Team Marine Parents™! 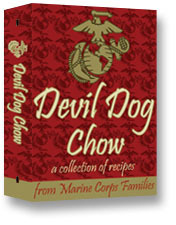 Devil Dog Chow™ is an amazing collection of recipes and inspiration. Families and friends from around the United States have contributed the favorite recipes of our Marines and recruits, honoring them in our own small way. Our love for our Marines and recruits can be found throughout this cookbook as it is found in our everyday lives. Top Photo courtesy of the USMC. Marines, Soldiers, Sailors, civilian contractors and Iraqi children sing �Silent Night� during the candlelight worship on Christmas Eve at Al Asad, Iraq, December 24, 2005. Photo by Cpl. Cullen J. Tiernan. MarineParents.com, Inc. is a 501(c)(3) public charity. MarineParents.com, Inc. was founded in January, 2003 in response to parents' needs to find information and to Connect & Share™ with one another during deployments. Our free online services and connections have expanded to support and educate Marine moms & dads, spouses, families and friends and we're now offering the Annual National Conference in St. Louis, 2007. We've helped over 30,000 Marine and recruit families during bootcamp, training, active duty and deployments. We've shipped thousands of care packages overseas to our Marines in Iraq and Afghanistan and sent thousands of prayers and letters to injured Marines. You've found a Place to Connect & Share™.